I've got another makeover for you all. It's been a minute! I was working on Estela Mag doing a beauty shoot using a new makeup palette. It's been too long since i've showcased a before and after. This look is light and natural and glowy. Check it out! I really worked on perfecting my model's skin. She had some active breakouts and discoloration. I used my Eve Pearl Salmon Concealer palette to neutralize darkness on her face. Then I concealed with my Graftobian Warm Super Palette. 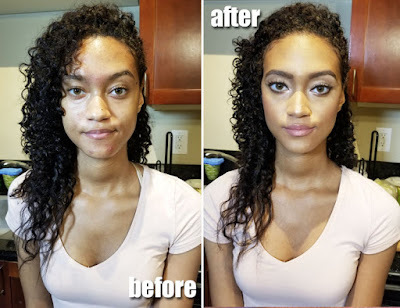 Afterwards I put a light layer of Makeup Forever HD Liquid foundation using a beauty blender to even out the rest of her skintone. Concealing only wear necessary and doing a light wash of foundation everywhere else gives the right amount of coverage without looking cakey. As for the final look, I used a rose highlight on her eyes and cheeks and a matching mauve lipstick on the lips. I filled in her brows to give her face more structure using MAC Stud and Spiked lip pencil. Then I defined her eyes using a brown pencil liner and some medium length individual lashes for lift. Hope you all enjoyed this quick makeover. More details on the makeup palette I used on this look coming soon!